For those mornings when getting out of bed requires superhuman effort, reach for this exceptionally cosy, yet somehow still smart, shirt. Part of the second in-house collection from Mr Porter, the mix of cotton and corduroy renders it fancy enough for the office but comfortable enough to pretend you’re still in your PJs. Make this the season you ditch that black and white striped top you’ve been wearing on repeat and add something different to your wardrobe. This dark beige and black version will bring a nautical touch to your everyday look while adding a bit of spice to an old classic. Almost 30 years after first hitting the market, the Nike Air Span II is making a return, but this fashion flashback is anything but dated. Dressed up in a laser orange colourway, it’s a retro-revival we can all get on board with. Welcome to the holy grail of sweatshirts. This crew neck style from the masters of premium basics at Sunspel is surprisingly refined for a sportswear staple. A tailored silhouette paired with classic detailing adds up to a perennially wearable classic that your friends, your boss and even your gran will approve of. Finding a decent styling product to put in your barnet each morning is half the battle – the other half is getting it out when the day is done. Enter the new Vinyl Pomade from Fudge. The coconut oil-infused formula lets you enjoy the right level of hold and shine, without any of the stickiness or build-up you might expect. Whether you’re a fully-fledged #influencer or haven’t quite figured out how to upload your first Instagram post, become part of the social media elite with this statement T-shirt from ASOS and New York-based boutique and creative platform VFILES. No previous vlogging experience necessary. Attempting to cram all your stuff in your pockets is an easy way to bring your look down a notch (or five). 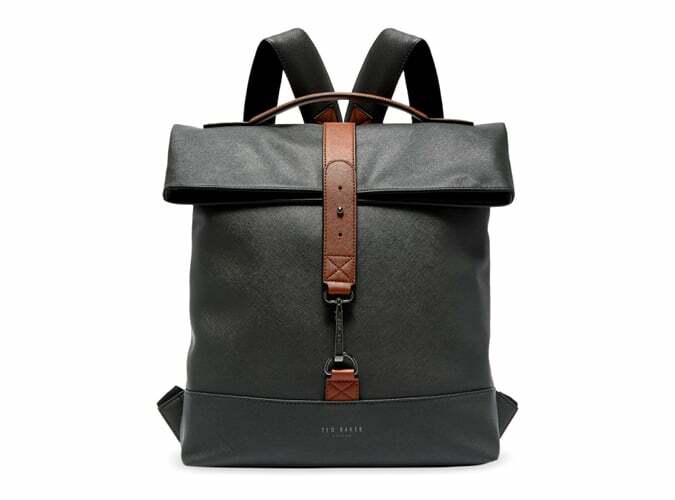 Ted Baker’s Rollah backpack offers a cool, contemporary way of carting your kit around while simultaneously putting paid to the idea that black and brown make a frown. The blisteringly cold days of winter will soon be behind us, and we’re sure we’re not the only ones eager to pack away the heavy-duty coats. Say hello to spring with a lightweight, on-trend khaki jacket, with a sleek collar, fun gold trims and a tailored fit. If you’ve nailed what to wear work, the pub and everything in between, don’t let standards slip in the gym. This high-tech sports T-shirt from the first active line by streetwear label Nicce is cut from a moisture-managing fabric and features contrasting stitch details and plenty of stretch to add comfort and cool to your workout. There’s nothing like the feeling of slipping into new joggers for the first time, so treat yourself to a spring-ready pair. The cut, fit and colour of this skinny take on trackies by Topman makes them smart enough to wear wherever, without people thinking you just slumped off the sofa. In case you needed a reminder that all the best items of clothing in 2018 hark back to a cooler era, Adidas’s latest watch is here to make it clear. The Archive model is inspired by the brand’s 1970s heritage and is the perfect excuse to put that newfangled smartwatch back in the drawer: who needs all that information anyway? The time alone will do. Wear your love of heavy metal on your sleeve (or, in this case, your chest) with this edgy collaboration from Vans. Even if you don’t know the name of a single Metallica album, pretend you’re part of an elite musical club by rocking the band’s logo proudly (and just hope no one asks you any questions). After a foolproof way to stop your girlfriend raiding your bathroom cabinet? Grab Bulldog’s new moisturiser, designed specifically for your stubble, which is loaded with aloe vera, camellia oil and green tea to take care of facial hair as well as skin. If your girlfriend has suddenly sprouted a goatee overnight, you’ve got bigger problems than dry skin. No man wants to get run over and found wearing a sad, sagging excuse for underwear. But that doesn’t mean you have to fork out for designer names. Opt for this absolute bargain: three pairs of New Look boxers, all in different colours, for less than a tenner. Footwear from the forces doesn’t end at military stompers. Inspired by the shoes worn by troops stationed in Burma, the desert boot has been a smart choice for almost 70 years. With soft suede uppers in a tan colourway, these ones from Kurt Geiger will make a welcome change from Chelsea boots. Slouch about at work in secret with these impeccably debonair yet covertly comfortable trousers from Mango. On the one hand, they’re smartly tailored, with a Prince Of Wales print, while on the other, they’re cut loose with elastic pleats on the waist. Sneaky. There’s certainly nothing ‘dainty’ about pink this season, with the shade getting applied to everything from shirts to streetwear. This hoodie from Reiss is an easy way to get reaccustomed with the shade. Mainly because it’s oh-so-millennial, and snug AF. Denim jacket season is on the approach, which means you’ll need to be savvy if you want to stand out. This example by Nudie takes the classic shape and renders it in tan corduroy for a decidedly on-trend seventies vibe. The clever chaps at Uniqlo always seem to read our minds and predict what we need, as we need it. In this case, it’s a sleek woven belt made from supple vegetable-tanned leather that will gain a unique look as it’s broken in between now and summer. Plus, when you consider that it’s put together by hand, it’s a steal for less than £25.